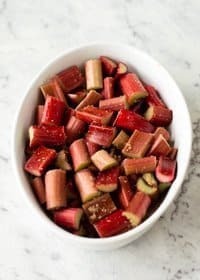 If you love rhubarb then you’ll love this Thermomix Rhubarb Crumble. Quick and easy to make and extremely comforting on a cold chilly day, especially if you have it with hot custard. A crumble is a typical English dessert in which many fruits can be used, the most popular being apples for Apple Crumble. 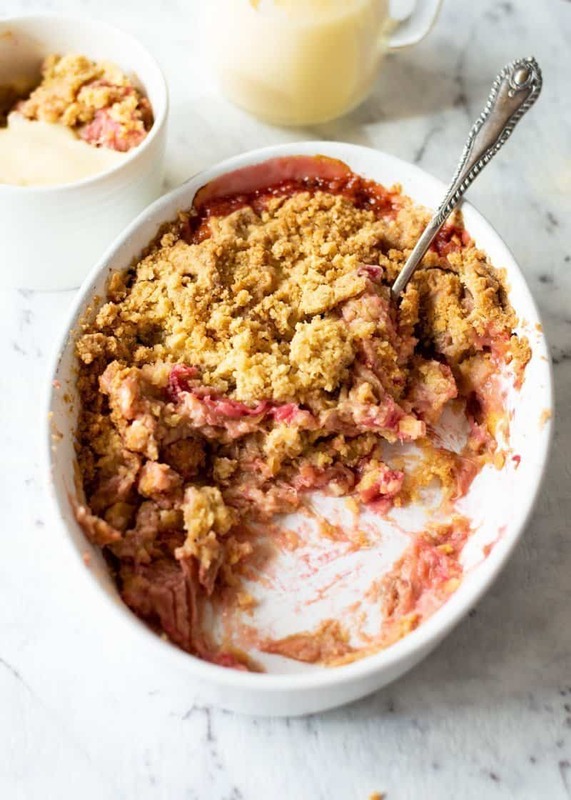 To make the most of rhubarb being in season, putting it in a crumble is in my opinion the only way to go – it’s comfort food at it’s finest! You can’t beat the delicious aroma wafting through the house whilst it’s baking. 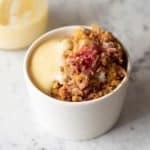 A traditional rhubarb crumble is best served with hot custard or if you’re not a custard fan then vanilla ice cream also works well. I’ve made the rhubarb filling mixed with just a little sugar but if you wanted to get fancy you could add some grated orange zest and a teaspoon of ground ginger. 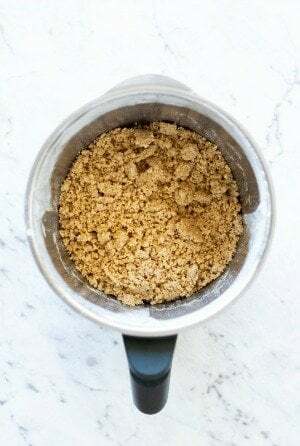 For the crumble topping, just mix the flour, butter and sugar in the Thermomix bowl for 20 sec/speed 5. The mixture should come together and look a bit like wet sand. The good news is you can make rhubarb crumble ahead and freeze it for another day. For best results, it’s best to freeze before being baked in the oven. Just assemble everything then cover well and put into the freezer uncooked. To thaw, defrost overnight in the fridge then bake as you would for 40 minutes. If you love a good Crumble recipe, then check out my Thermomix Apple Crumble. 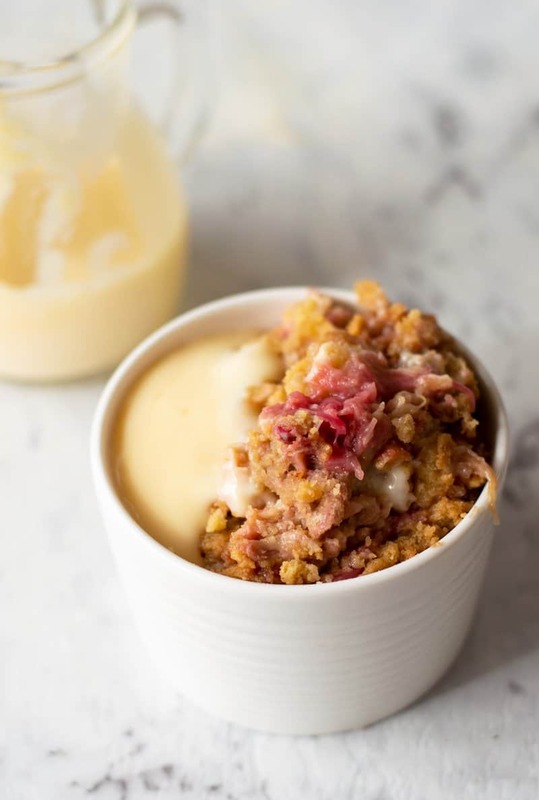 An easy recipe for rhubarb crumble which is a perfect wintry dessert. Served with piping hot custard it’s comfort food at it’s finest. Preheat the oven to 200°C (180°Fan Forced). For the Rhubarb Filling: Wash and trim the rhubarb stalks and cut them roughly into 1-2cm pieces. Arrange them in an oval shape baking dish (I used 23cm x 17cm one) any leftovers can be put into a ramekin. Rhubarb shrinks alot so don’t be afraid to pile it high. To Assemble: Pour the crumble topping over the rhubarb filling and press down gently with the back of a fork. Bake in the oven for 40-45 minutes until golden brown and the rhubarb starts to bubble and ooze from the sides. Serve immediately with piping hot custard or a scoop of vanilla ice cream. To Freeze: Just assemble everything then cover well and put into the freezer uncooked. To thaw, defrost overnight in the fridge then bake as you would for 40 minutes.